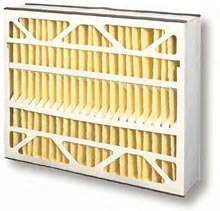 We now offer a generic filter replacement option for the Air Bear/Trion filters. These cartridges are an exact replacement and require no modifications. Fedders Corp makes the Trion Air Bear whole-house media air cleaners to be much more efficient than ordinary disposable type furnace filters. In fact, Trion Air Bear media filters consistently perform well due to their highly efficient synthetic material, featuring extended-surface pleats that have a higher dirt-holding capacity than similar filters. You can order your Air Bear/Trion filters online, using PayPal, which offers VISA, Mastercard, American Express, Discover and eCheck. If you don't have a PayPal account, you can still make your online purchase using one of the above cards. Just select the option "If you do not currently have a PayPal account" continue processing order.